So for my first post I had to talk about the tastiest cut of beef in the world. Yes the World. Coming out of a small village on the outskirts of Lisburn Co Down, Hannan Meats is fast becoming (if not already) the UK's premier meat producer. A winner of countless awards and Great Taste trophy's this 50 day aged cote de boeuf is in my opinion the most flavorsome cut of beef there is. Aged to perfection in Peter's (Peter Hannan) very own Himalayan Salt Chamber the depth of flavor this aging technique produces is the reason why Fortnum and Mason choose stock it in their famous store. I could write a dissertation on this cut of beef and Hannan's other products but instead I am going to leave my first post short and sweet as I foresee their being many more posts about Peter, the Willy Wonka of meat. 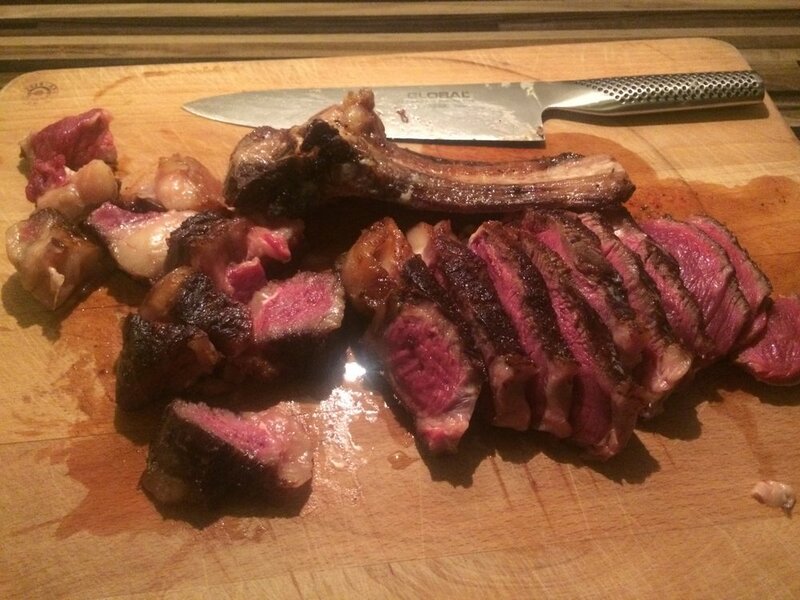 I have cooked many a Cote De Boeuf both on the grill and pan fried. Each method is delicious in their own right but for this post the beef was pan fried in Kerry Gold Grass fed butter. 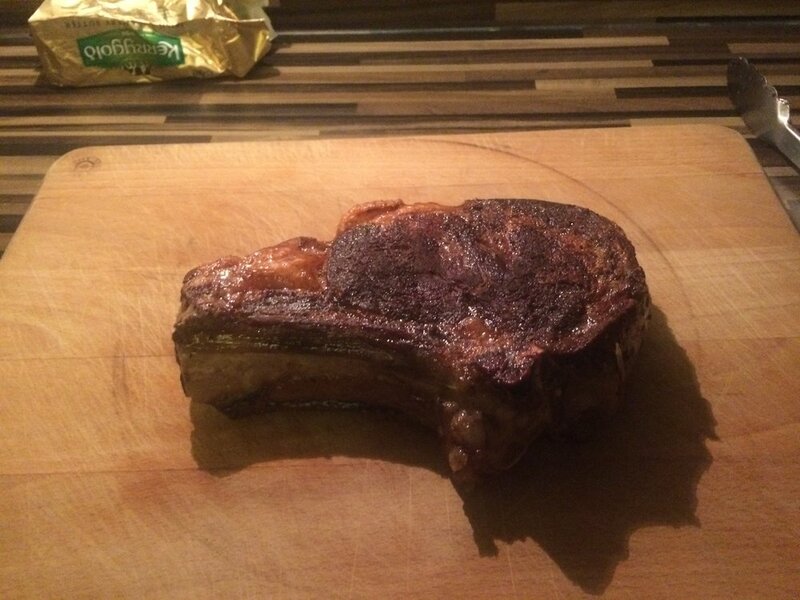 With a cut of beef like this all I use is pink Himalayan salt and cracked black pepper, NOTHING ELSE! Allow the pan to get up to temp, you want it to be just starting to smoke, add about 3-4 generous nobs of butter and a full separated head of garlic along with a slight drizzle if olive oil to stop the butter from burning. Add the beef and let each side form a nice crust from the salt and pepper turning every 3 minutes. In my opinion there are two differences between restaurant tasting steak and the steak the majority of the population cook. The first is the basting of the steak with the butter and the garlic cloves. The butter gives a nutty flavor and the garlic cloves (with the skin still on) produces that subtle aromatic flavor that is steaks best mate. Just be careful you don't leave the garlic cloves in the pan too long, you want them to cook in the butter until the skin turns light brown. The second difference is allowing the meat to rest for at least 10 mins and remember to use the resting juices in your pepper sauce! (My recipe to come later). As you can see from the pics I like my beef rare so the cooking time was about 15 mins over a medium to low heat (if the heat is too high you will burn the outside of the steak and it will become acrid to taste). This was for a full rib weighing just under 1 kg. Serve with triple cooked chips and your choice of sauce.